Looks like Oprah has had a pretty great effect on Lululemon stock. 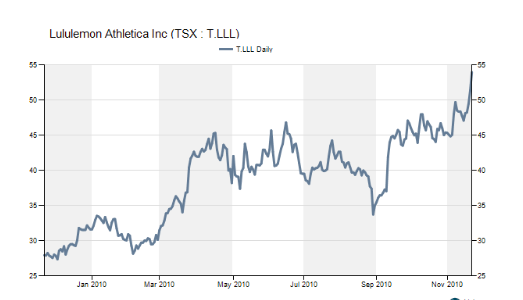 This is a 52 week high for Lululemon stock on the TSX which jumped from Friday at 51.39 to an all time high of 54.32 (5.8% higher) today ever since the Oprah’s Ultimate Favourite Things 2010 episode on Friday featuring Lululemon Relaxed Fit Pants. The high of the year was reached this morning at 11am. Here is an article from Yahoo News. "Newest Items – Ruffles, Ruffles Everywhere.."
"Relaxed Fit Pants – New Print!"